We’re moving further along through springtime; another week and we’ll be halfway done. (Spring vernal equinox was March 20; summer solstice will be June 21.) My nose tells me we have quite a way to go, and if that isn’t enough discomfort, the snowdrifts of tree pollen forming everywhere offer visual confirmation. Despite this, mid to late spring is a great time for urban hiking around the DC area. All the cherry blossom tourists have left town, but schools are in session and vacation season has not yet arrived. The combination means you can see some of the interesting sights without struggling through crowds of folks with similar objectives, and the mild spring temperature doesn’t heat up the pavement and stone enough to force a retreat to shadier trails. Here’s a couple of urban hikes we took during the past two weeks. We first did this hike last year to explore some of the landmarks of Capitol Hill centered on the Eastern Market area. The hike encompasses the area from First to Thirteenth streets (east/west) and M St SE and C St NE (north/south). In addition to a Google map, there’s a print map describing some of the landmarks here. 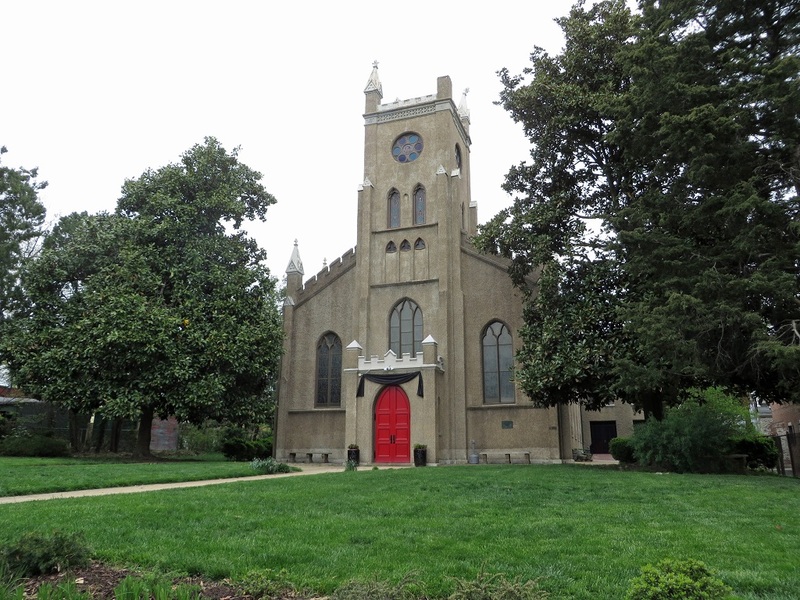 One of the landmarks we passed during the hike is Christ Church, near the Navy Yard at 620 G Street S.E. On the day of our visit the church entrance was hung with a black sash, just as it was for the 30 days following Lincoln’s death on April 15, 1865. Lincoln’s assassination posed a unique challenge for the parish, because while the congregation was pro-Union, it turned out that one of the assassination conspirators, David Herold, was a member of the parish. Herold rode with John Wilkes Booth during his escape from Washington after shooting the president on the night of April 14. Twelve days later, on April 26, Union cavalry cornered the pair in a tobacco barn at Bowling Green, Virginia. Herold surrendered, but Booth was shot and killed. During the subsequent military tribunal, Herold admitted his guilt, and the only defense offered by his attorney was that Herold was “feeble minded,” and a member of Christ Church parish testified to that effect. The defense must have seemed weak, though: in addition to helping Booth escape Washington, Herold led co-conspirator and former Mosby Ranger Lewis Powell to the home of William H. Seward, the Secretary of State, and held Powell’s horse while Powell attacked and stabbed Seward five times. In any case, Herold and the other conspirators were executed by hanging at the Washington Arsenal (now Fort McNair) on July 7, 1865. Roosevelt Island by itself is too small for a hike, and parking there is next to impossible (the lot is usually taken up by the cars of bicyclists using the Mount Vernon Trail), so when someone suggested a hike there, the only logical course was to start somewhere else and combine it with something else to generate a pleasant two-hour hike. The Rosslyn Metro Station is fairly convenient, so our route led from there to Roosevelt Island, and continued downstream along the Potomac to the Arlington Cemetery Visitor Center for a break. Our return to Rosslyn took us past the Netherlands Carillon, the US Marine Corps War Memorial, and Dark Star Park. For some reason the carillon bells did not sound at noon, but the tulip garden was already looking good, just in time for Dutch Liberation Day on May 5. There’s a few more familiar urban hikes to squeeze in over the coming weeks: a visit to the fountains and gardens in the east end of the National Mall, a tour of the mansions and landmarks of the Dupont-Kalorama District, and a hike through the Palisades District a little farther west. This entry was posted in Hiking, History, Photography and tagged Christ Church, Dark Star Park, David Herold, John Wilkes Booth, Lewis Powell, Marine Corps War Memorial, Nathanael Greene, nature, Netherlands Carillon, outdoors, Potomac Heritage Trail, Potomac River, Red-winged Blackbird, Washington DC. Bookmark the permalink.